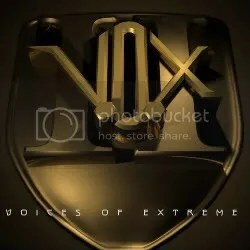 Break the Silence is the 2nd album from Voices of Extreme. I haven’t had a chance to hear that first release but this particular album is a blend of alternative and melodic hard rock. There are some names of interest associated with this band. First and foremost, Iron Maiden’s Nicko McBrain co-manages the group. In addition to that, drummer John Macaluso as played in TNT, Riot and with Yngwie Malmsteen while guitarist Rob Katrikh was a member of Doro Pesch’s band. So there’s definitely some old school heavy metal blood running through this band even if their music does not necessarily reflect that. Since their debut in 2005, the band has scored some good gigs opening for Alice In Chains, Disturbed and Godsmack. And really, Voices of Extreme sound like they would fit in well with bands of that ilk but there’s certainly enough hook and melody here for the hard rock fans that may not necessarily gravitate towards alternative rock/metal groups. Most of these songs sound radio ready and there’s enough of a chance of pace and sound throughout the album so that I didn’t get bored. There’s really a bit of something for everyone: alternative/post-grunge rock, melodic rock, flat out heavy metal, fast numbers, mid-tempo numbers. V.O.X. doesn’t try to confine themselves to one genre of rock and that’s pretty cool and vocalist Don Chaffin has a great voice that can go along with any spin the songs offer. The album really caught me off guard with just how catchy it is. “Damned” is a great choice to start off the album, it’s one of the best songs and immediately was stuck in my head after the first listen. I can’t decide which song is my absolute favorite — “Damned” or “Made of Stone”! V.O.X. has a lot to offer. The group seems like a melting pot of various rock/metal styles and I think this album should please most rock ‘n’ roll fans.